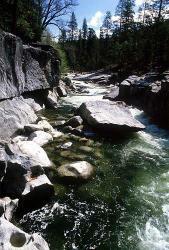 The North Fork of the Stanislaus river requires technical whitewater skills to navigate through large hydraulics, tight drops and rive hazards typical of high mountain streams. Because of its steep gradient and narrow channel,the North Fork of the Stanislaus can be navigated by raft at flows from 350 cfs to approximately 3, 000 cfs. The river channel is very narrow and steep. Flows below 600 cfs make this already technical river even more challenging. At flows between 600 and 1,800 cfs rocks get covered and routes open up, making passage through tight channels less of a squeeze. Above 1,800 the nature of this river changes. Because of the rivers' confined channel, increasing flows are unable to dissipate over the riverbanks. The only place for the water to go is downstream, creating numerous hydraulics and few eddies or recovery pools. The most consistent and best flows on the North Fork of the Stanislaus come from the Spring snowmelt in April and continue till about June, depending on the winter snowpack. Once this run-off ceases the flows are controlled by 3 upstream hydroelectric dams: Union, Utica, and New Spicer. Releases between mid-June to late-August have been inconsistent in past years, due to issues revolving around California energy deregulation. Typically, flows are higher during midweek (especially Monday -Thursday) and also tend to increase towards the end of the summer as temperatures rise and power demand increases. Historically these dams have increased their releases in the fall (September-November) in order to drop their water levels by winter, which provides for some great fall boating. Information regarding scheduled releases is difficult to acquire. Release schedules vary dramatically, and are not easily accessable. Because commercial whitewater rafting outtfitters rely on this information to schedule trip dates for the general public, they are often up to speed with current release dates provided by the major utilities.